The big present for Christmas… Stan’s new cat tree. So far, he’s loving it. Hasn’t moved since we got home and I put it in place in front of the window. It’s prefect and exactly what I wanted and now I don’t have to make one. I’m tired today. I was up late again last night and was up early this morning to get ready to come home. We had to pack everything up, round up Teege and Manni and their various snowboarding equipment and head into town. I’m thinking a nap sooner than later is a good idea since that couch is calling my name. Then I’ll catch up with everything else (my Google Reader is showing 4000 new items… yikes). 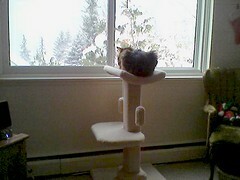 I want a cat tree, only bigger. For me. It looks fun!! Wow, what a perfect gift. Looks like Stan loves it, too! Looks like Stan is lovin’ his cat tree. Happy New Year!! Wishing you a wonderful 2008!